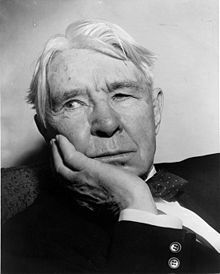 Carl August Sandburg (6 January 1878 –22 July 1967) was an American poet, historian, novelist, balladeer and folklorist. There are some people who can receive a truth by no other way than to have their understanding shocked and insulted. We may pull apart the petals of a rose or make chemical analysis of its perfume, but the mystic beauty of its form and odor is still a secret, locked in to where we have no keys. Back of every mistaken venture and defeat is the laughter of wisdom, if you listen. Every blunder behind us is giving a cheer for us, and only for those who were willing to fail are the dangers and splendors of life. To be a good loser is to learn how to win. I was sure there are ten men in me and I do not know or understand one of them. I could safely declare, I am an idealist. A Parisian cynic says "I believe in nothing. I am looking for clues." My statement would be : I believe in everything — I am only looking for proofs. Incidentals (1904); this is sometimes paraphrased: "I am an idealist. I believe in everything — I am only looking for proofs." on silent haunches, and then moves on. I want the respect of intelligent men but I will choose for myself the intelligent. I love art but I decide for myself what is art. I adore beauty but only my own soul shall tell me what is beauty. I worship God but I define and describe God for myself. I am an individual. The pleasure of my own heart shall be first to inform me when I have done good work. the assassin... in the dust, in the cool tombs. Tell me if the lovers are losers... tell me if any get more than the lovers. The Republic is a dream. The name of an iron man goes round the world. It takes a long time to forget an iron man. They wear long boots, hard boots. "They are for war. They fight and each tries to kill as many of the other side as he can." The girl held still and studied. "Do you know … I know something?" "Yes, what is it you know?" They will be tricked and sold and again sold. And go back to the nourishing earth for rootholds. A baby is God's opinion that life should go on. A book that does nothing to you is dead. A baby, whether it does anything to you, represents life. If a bad fire should break out in this house and I had my choice of saving the library or the babies, I would save what is alive. Never will a time come when the most marvelous recent invention is as marvelous as a newborn baby. The finest of our precision watches, the most super-colossal of our supercargo plants, don't compare with a newborn baby in the number and ingenuity of coils and springs, in the flow and change of chemical solutions, in timing devices and interrelated parts that are irreplaceable. A baby is very modern. Yet it is also the oldest of the ancients. A baby doesn't know he is a hoary and venerable antique — but he is. Before man learned how to make an alphabet, how to make a wheel, how to make a fire, he knew how to make a baby — with the great help of woman, and his God and Maker. If she forgets where she came from, if the people lose sight of what brought them along, if she listens to the deniers and mockers, then will begin the rot and dissolution. On America, in Remembrance Rock (1948), epilogue, Ch. 2, p. 1001. Interview with Frederick Van Ryn, This Week Magazine (January 4, 1953), p. 11. Sandburg previously used these words at a rally at Madison Square Garden, New York City (October 28, 1952), praising Adlai E. Stevenson during the latter's 1952 presidential campaign. Reported in The Papers of Adlai E. Stevenson (1955), vol. 4, p. 175. The United States is, not are. The Civil War was fought over a verb. Orval Faubus don't know that. But he gonna know, he gonna know. Comments at the centennial celebration of the Lincoln-Douglas debates; Knox College, Galesburg, Illinois, Oct. 7, 1958. Quoted in Herbert Mitgang, "Again—Lincoln v. Douglas", The New York Times Magazine, Oct. 19, 1958, pp. 26-27. Quoted as Sandburg in Stop Whining! Start Selling! : Profit-Producing Strategies for Explosive Sales Results (2003) by Jeff Blackman, but without citation of original source; this is elsewhere attributed to Antoine de Saint Exupéry, but also with no original sources cited. This line appears in section 94 of "The People, Yes" (1936), but that section contains many common proverbs and expressions not original to Sandburg which he is merely quoting within the poem, including this one. There is a growing tendency, as his fame goes up in the world, to speak of Carl Sandburg as a He man, an eater of raw meat, a hairy one. In Chicago newspaper local rooms he is spoken of as John Guts. I do not think of him so although I've a suspicion that he sometimes writes under the influence of this particular dramatization of his personality. Buried deep within the He man, the hairy meat eating Sandburg there is another Sandburg, a sensitive, naive, hesitating Carl Sandburg, a Sandburg that hears the voice of the wind over the roofs of houses at night, a Sandburg that wanders often alone through grim city streets on winter nights, a Sandburg that knows and understands the voiceless cry in the heart of the farm girl of the plains when she comes to the kitchen door and sees for the first time the beauty of our prairie country. The poetry of John Guts doesn't excite me much. Hairy, raw meat eating He men are not exceptional in Chicago and the middle west. As for the other Sandburg, the naive, hesitant, sensitive Sandburg—among all the poets of America he is my poet. Sandburg in his poems uses neither metre nor rhyme, but if he gives an impression of ragged ease it is not much more than a surface impression. His verse... is highly organized; it is not free verse at all, in the common acceptance of the word. Rather it is repetitive verse. He uses parallel constructions; he repeats words and phrases with great skill; thereby he produces effects as complex and difficult sometimes as those of Swinburne's most intricate ballades. ...Sandburg is alien to most of the Anglo-Saxon elements in American life. Its aspects which he chooses to describe are those precisely which distinguish it from life in England. He talks about stockyards, wide sweeping prairies, the growth of mushroom cities, Hell on the Wabash, Watch your Step. He talks about booze runners, hankey panks, humpties (whatever they are) bulls, and Charlie Chaplin. He never mentions tea, gentlemen, golf, or any other of our briticisms. He is an American; not an Amayrican with the r trilled lightly against the upper teeth as in Back Bay, but a ril Amurricn. He avoids the language along with everything else that is English. He never wrote an American dictionary, but he does something more hazardous and exciting: he writes American. With earlier authors American was a dialect; it was the speech of the comedian and the soubrette; the hero, when serious, declaimed his Sunday-best Oxford. The case is opposite with Sandburg. He writes American when he is pompous, philosophic, sentimental; in a word when he is most upstage... Sandburg writes American like a foreign language, like a language freshly acquired in which each word has a new and fascinating meaning. It is a language, in fact, which never existed before; the separate words existed, but in the speech of no one man; Sandburg was the first to thesaurize them. The Sandburg heaven is nothing but the common street seen upside down. It's a place where the Lord isn't even a president, but a sort of composite of his own kin of earth folk and earth things. The imagistic poem, Loam, concentrates this thought... There are certain well intentioned mortals who, as soon as they hear the mere name, poetry... grovel, and then indulge in a whole category of spasms to the tune of that monstrosity, idol-worship.They are priest and congregation of every institution and gathering where Art and Uplift are synonymous. Fellows like Sandburg... don't belong to such devotional conclaves. Sandburg lives on the level. If he has dealings with poetry he has them on the ground common to both, as to trees, rocks and streams. ...the first thing I saw on the table of this man poet—Robert Frost, by the way—was a copy of Sandburg's Cornhuskers. Does the coincidence require commentary? The Review of Reviews... avers that Mr. Sandburg's 'amazing impressions of Chicago' are making history, and the Observer... thinks that 'no one can fail to be moved' by his 'experiments in the loose forms popularized by Whitman.' But the New Statesman... cannot quite stomach Mr. Sandburg. Again its critic... can find nothing better to say than that 'Mr. Sandburg sometimes overtops mere crudity,' and... can only add that Mr. Sandburg has 'achieved a few good things where a poetic sensitiveness survives the crushing effect of much American journalism.' The Saturday Review is at least downright in its likes and dislikes; its critic finds that the American poet 'makes up for a lack of limpidity and music by sheer brutality,' or 'with a total bankruptcy of metre.' But then, the Saturday Review is conservative, which Mr. Sandburg emphatically is n't. Mr. Sandburg possesses a powerful imagination, which plays over and about his realistic themes and constantly ennobles them. ...strikes, and factories, and slaughter-houses, and railroad trains, all take on a lyric quality under his touch. ...When Carl Sandburg left college, he was no longer an unskilled labourer, working with his hands. He was a thinking man, with a brain charged with ideas and emotions, determined to do his part in bringing about the millennium. For Carl Sandburg... is a revolutionary; he must push the world to where he is convinced it ought to be. ...again and again, he deserts the seer's mountain peak for the demagogue's soap-box. ...Mr. Sandburg is like a man striving to batter down a jail with balls of brightly coloured glass. ...Whether constant preoccupation with disease is a healthy form of literature, whether it acts as a curative, is open to question. But we can surely say that to be curative the disease must be treated unsentimentally and truly. Mr. Sandburg has aimed at doing this, has striven hard to do it. For this, one honours him above his fellows. For this, and the spirit of beauty which pervades his work. The late Mr. Sandburg was a public performer of the first rank ("Ker-oh-seen!" he crooned in one of the first TV pitches for the jet-engine — ole banjo on his knee, white hair mussed by the jet-stream), a poet of the second rank (who can ever forget that feline-footed fog?) and a biographer of awesome badness. This page was last edited on 20 January 2019, at 16:45.